How Does Election Commission Andhra Pradesh Helps You Get A Voter ID Card? It monitors the work relating to the conduct of General Elections and Bye-Elections to the House of People from Andhra Pradesh, A.P. Legislative Assembly and A.P. Legislative Council. This includes preparation and updating the Electoral Rolls, Issue of Photo Identity Cards to Electors, rationalization/re-organization of Polling Stations, voters’ education, and implementation of Model Code of Conduct, the Election Laws and the instructions issued by the Election Commission of India from time to time. The Andhra Pradesh CEO maintains a website where the voters can easily login with their dedicated username and password to apply for their new voter ID card or make changes in the voter list. • CEO Andhra e registration – When you visit the AP CEO’s website, you will find a e-registration link which leads the new users to login and register for a voter card. Once on the page, the new voter can register for the voter ID online by filling in Form 6 and providing some credentials to validate the information given in the form. The CEO delegates this job to the Block Level Officer, who verifies the form and the card. The voter can expect to get the voter ID card within two months. 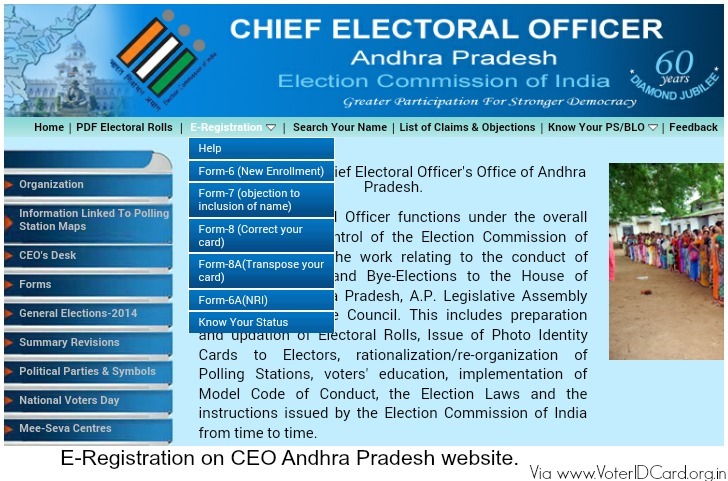 • CEO Andhra application status – The CEO will oversee work to ensure voter cards are given to the applicants after verification and the status is updated in the website. Why wait to get to know your application status? Why visit the CEO office to check whether you have got your name updated in the voter list? By clicking on the ‘Know your Status’ you can find out if your application has been accepted and voter ID is on its way to you. Form-7: Objection to inclusion of name. Form-8: Correction in the card. Candidates who don’t have a voter id card yet have to select the Form-6 for new application registration. Select Form-7 for the any objections regarding the inclusion of name. Select Form-8 in case if you have any corrections to be made on already issued voter ID card. Candidates who don’t have a voter id card have to select the Form-6 for new application registration. 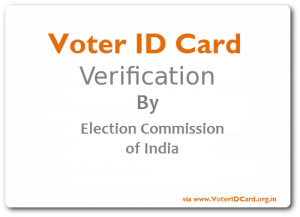 How Does Election Commission Helps To Get A Voter ID Card Andhra Pradesh? Although there is a brick-n-mortar office of the CEO AP to look into issues related to Andhra Voter List and Andhra Pradesh Voter Card e-registration, the Andhra Pradesh CEO maintains a website where the voters can easily login with their dedicated username and password to apply for their new voter ID card or make changes in the voter list. • Access http://www.ceoandhra.nic.in website. The Home Page of the website is displayed. It asks you to register with your credentials to get your username and password. • Once done, you will get a unique username name and password. • Login with this user name and password. You will be directed to an e-registration link. Click the E-registration link. You will come across various forms. Use Form 6 if you are a new voter without a voter ID card at all. Use Form 8 if your name is not in the voter list of your assembly constituency or data in your voter ID card is wrong. Use Form 8A if you have changed your address in the same assembly constituency in Andhra Pradesh. Once done, you need to click the Submit button. A registration number would be provided to you. Don’t forget to submit hard copies of your age proof and address proof to the nearest Election Registration Officer (ERO)’s office. In case, you are not a new user, Andhra Pradesh CEO’s department will send across a voter ID card through post. If you are a new voter, the Booth Level Officers (BLO) will visit you to verify the credentials. Once verified, you can expect to get your voter card soon. How Do I Check the Status of My Voter ID Card Andhra Pradesh? • You need to select whether you’re going to check status for Form-6 or Form-8 or Form-8A. • Enter the application ID or House number or Applicant name to know the status. • If your name is present in the Electoral rolls and you did not receive your Electors photo Identity Card (EPIC), visit the nearby polling station or election commission office. For more details, you visit ceoandhra.nic.in. The Andhra election authorities have also gone a step forward and offered another amazing service on mobile. The voters living throughout Andhra Pradesh can now also find out whether their names are in the voters list of their area using mobile phones. This application can work in any mobile phone that has Android operating system. You can download this mobile phone application directly from the official website. In addition to it, the CEO AP has also devised its very own mobile application for the voters, right across the entire state to find the status of voter ID in AP. The voters can simply send an SMS on the number 9246280027 to know details like polling station and ERO details of their own areas.